Fork Mounted Bucket - Usually, when businesses are calculating all of their expenses and would like to lessen overhead, acquisitions of equipment and unnecessary equipment rentals are possibly the first items to be eliminated. A lot of construction companies feel that loaders have become a cumbersome expense and a lot of their jobs can be completed with the versatility and effectiveness offered by forklift buckets. A lift truck bucket can be obtained for less than it really costs to lease a loader for a few months. It would transform your extendable reach lift truck into a material loading and handling piece of equipment which functions effectively. This setup will offer increased range than typical loaders and have a lot more flexibility on the whole. Completing tasks such as placing gravel on a large, flat roof to dumping trash into a dumpster could all be safely and quickly done. There are various forklift buckets presented meant for particular applications. Universal Fit buckets likewise known as "slip-on-the-forks" forklift accessory buckets. These buckets can be utilized along with whatever make and model of extendable reach lift truck. If your unit can't be matched with a quick-tach component, another new or second-hand universal fit bucket can be located as an alternative. 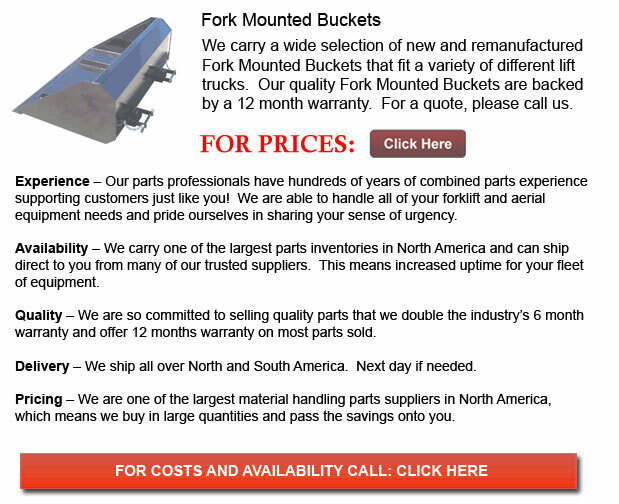 Standard universal forklift buckets connect to forks which are up to six inches wide and are forty eight inches long. Bigger fork pockets can be ordered through an account executive upon request. Because universal fit forklift buckets slip onto the blades directly, they stay on the equipment and are a lot less vulnerable to damage. These buckets are also 50% deeper as opposed to the quick-tach bucket models. This extra space makes them ideal for carrying irregular shaped loads like for example tearing off roof trash, elevating roof gravel, moving large debris piles, broken up concrete and backfilling behind walls. Quick-Tach Buckets are made for extendable-reach lift trucks. They are designed to allow placement of materials far beyond the reach of a loader. A hardened beveled cutting blade on both sides and on the leading edge reinforces strength, resistance to damage and provides supreme durability. Quick-Tach lift truck buckets are enhanced by scuff bars along the base of the unit that protect it from scratches. Quick-Tach forklift buckets can be used to replace the carriage and forks that weigh between 100-700lbs. Once set up, these buckets free up more of the unit's load capacity, enabling it to handle heavier and bigger things. The Quick-Tach is able to pour objects approximately 1.5 feet higher thanks to the shorter depth of its bucket. These buckets are built in a custom fashion in order to meet the specifications of certain makes and models of forklifts. It is important to confer with a construction equipment specialist so as to find the customized Quick-Tach bucket solution for all of your requirements. Forklift bucket accessories are outstanding for ground level work on construction location sites. They are normally meant for transferring snow in northern areas, and gravel and sand loading. Jobsite clean-up is another function the lift truck bucket performs well. The many purposes the bucket can complete saves the company a lot of time and money since it does have to entirely switch tools or machinery and this can help avoid running into overtime.